Let me say up from that the majority of Taxi drivers are hard-working, honest individuals. But as in any profession, there are some ‘bad apples’ who ruin it for others. These taxi scams exist in just about every city in every country. This in no way implies that travellers should avoid taking taxis. Travellers should exercise caution when taking a taxi—just as they should exercise caution in anything they do at home or abroad. You hop into a taxi at the airport and after the very friendly driver asks where you are going, he explains that there is a major traffic or construction problem on the direct roadway or highway, leading to your destination. He will have to go out of the way but assures you that in the long run, you will save time because you will not be sitting in traffic. As you are most likely not familiar with the city and the roads, you agree. The driver then takes the most out-of-the-way route possible, and your taxi bill is much greater than you ever dreamed it could be. Many drivers will do their homework before presenting you with the circuitous route plan. They will ask “Is this your first time in ____”? If you say Yes, then you could be a sitting duck for any tricks the driver wants to play. The advice is to say NO, and not provide any further explanation. What to do? Before you hop in a taxi, ask at the traveller’s information desk about road conditions between the airport and your destination. Then you can refuse the taxi driver’s offer to take another route to your hotel. Also, most guide books—as well as internet sights—as well as trained travel counsellors—will be able to tell you the approximate taxi fare from the airport to your hotel. If you find the taxi fare is much greater, then take down the driver’s information in case you choose to lodge a complaint later on. This popular scenario involves the taxi driver telling you that he will take you to your hotel for free, if you would first allow him to take you to his brother’s jewellery store. He explains that all you have to do is look—and if you don’t want to buy anything, that is ok. If you agree to do this, then believe that you will not be able to leave that store without buying something expensive. The storeowner is a master of the hard sell and they may have a few muscled men stand at the door to dissuade you from leaving. Therefore if a taxi driver makes you this offer, say “NO’ or get out and look for another taxi. The taxi driver comes into the airport terminal, approaches you and offers his taxi service—which you agree to take. When you arrive at the taxi (usually parked far away from the other taxis) there is already someone sitting in the front seat. The driver explains that this is his cousin (or brother). Avoid this scene altogether. Turn around, head back to the terminal and ask the information desk for tips on how to recognize legal taxis. Just think—that if you get into a taxi with 2 people—then you are outnumbered, should they have anything nasty in mind. You tell the driver the name of your hotel and he speeds off from the airport. After a few minutes he asks if you have stayed at that hotel before. If you say Yes—he will ask you when you stayed there—and then he will concoct a story of how it has changed for the worse since that time. If you say No, then he will explain that it is a bad hotel with a bad reputation. And of course, the driver knows of a better hotel in a great location, owned by his brother. The driver gets a commission for bringing people to the hotel. The advice is to keep saying “no thank you. Just take me to the hotel that I have booked”. If the driver persists, suggest that you will get out of the taxi right there—so he has a choice to take you where you want to go or lose the fare. You hail a taxi and speed off to your destination. After a few minutes, you notice that the Taxi Meter has already racked up $10.00 in charges, when you have not even traveled one mile. You point this out to the driver, who pretends not to know what you are talking about. You point to the meter and all he says back to you is “Yes, Taxi Meter”! After several back and forth attempts to have the meter re-set to “0”, as it should have been when you entered the taxi, tell the driver to stop, and signal that you will get out right then and there. Chances are the driver’s understanding of English will improve and he will set the meter properly. And a note on taxi meters. 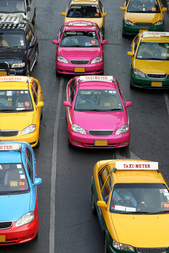 In many countries, drivers negotiate a fare with a client—before the client gets into the taxi. Meters are not used. Make sure you agree on the fare before getting into a taxi or you will get a big surprise when you arrive at the destination. It is ok to do some research. Ask at the hotel what you can expect to pay—or ask a few different drivers—to get an idea of the approximate cost. If the driver can write down the agreed-upon fare, then you have something to show him if, when you get to the destination, he changes his mind and wants a different fare. Your luggage will not fit into the trunk (the boot) of the taxi, and while it could fit into the back seat, the driver insists on lowering the trunk hood and tying it down with a rope or string, for the drive from the airport to the hotel. Once he leaves the airport, the driver seems pre-occupied on his cell phone—but you don’t understand the language. Once in the city. The driver stops at a red light and out of nowhere, a man runs up to the car, snips the rope holding the hood down, and runs off with your luggage. The driver pretends to be outraged and he yells and screams but nothing comes of this. He offers to drive you to the police, but you are probably very upset and want to go to the hotel to see if they can provide any assistance in your own language. Was this a scam? Most likely yes. It all happened a bit too conveniently to be just a routine robbery. If your luggage does not fit in the taxi you can always look for a larger taxi. If the driver has to tie your luggage into the trunk or on the roof, make sure it is a good rope, tied securely. Also, taking a photo of the taxi with the luggage already tied down, usually discourages the driver from perpetrating any scams. The taxi driver sees that you are in a hurry, so he gets you to the airport as quickly as possible. He walks outside to take your luggage from the trunk—you pay him and he starts rummaging around for change. He will either delay so much that you will tell him to ‘keep the change’ or he will find some crumpled bills in his pocket and press them into your hand and advise you to ‘hurry to catch your flight—have a safe trip home’. You stuff the bills in your pocket and after you check-in for your flight—you unfold the bills, only to discover that the driver helped himself to an even larger tip than the one you thought you were giving him.